You’ll probably have heard about Manchester United’s penchant for crossing in their match against Fulham yesterday. If you haven’t, all 81 of them are illustrated below in their full chalkboard glory. 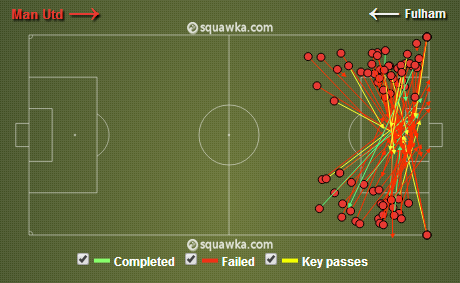 Manchester United’s crosses in the Premier League match against Fulham on the 9th February 2014. All 81 of them. Image via Squawka. Rather than focus on the tactical predictability of such a strategy, I’m going to take a look at whether it can be a successful one over the long term. In the public work on attacking strategies, the analytics community isn’t quite at the stage where the merits of individual strategies has been quantified. The work so far suggests that crossing is probably on the lower end though in terms of effectiveness. Ted Knutson did a nice summary of the work in this area here. Given this, I’m going to assess crosses from a different angle. Over the past five seasons, the Premier League Champions have averaged 2.3 goals per game. The fourth placed team has averaged 1.8 goals per game. This suggests that a top team needs an attacking strategy that can yield around two goals per game. Let’s see if crossing can get you there. I’m going to focus on open play crosses as I feel that is more relevant from a tactical perspective; set piece crosses are a different (more effective) matter. Based on data from the 2011/12 Premier League season, I found that on average it took 79 crosses in open play for a single goal to be scored. On average, teams had 22 open play crosses per game. So an average Premier League team would expect to score a goal from an open play cross every three-to-four games. I only have data for one season, so let’s be generous and round that down to a goal every three matches. That is a long way off two goals per game. Let’s consider an example of a team that both crosses more than average and converts those crosses into goals more efficiently e.g. Manchester United in 2011/12. They averaged 22 open-play crosses per game and scored 19 goals, which works out at 43.5 crosses per goal. So even a really good crossing team in terms of their goal return could only manage a goal from an open play cross every two games. The caveat to this last point also is that I don’t have the data to look at whether that is a sustainable level of goal production from crosses. Based on the above, I would say it is basically impossible to be an elite team and use crossing as your main strategy. If you were good at set pieces, you could probably add another 20 or so goals over a season but that still only puts you at a goal per game average. That isn’t to say that crossing is pointless – as a part of a varied attacking approach and against an opponent who isn’t dug in and ready for them, they can be an effective source of goals (see the video of Dani Alves assists below and Luis Suarez’s sublime assists in the past two games). This is where the problem occurs for Moyes. According to WhoScored, in the last three seasons under Ferguson, Manchester United averaged 27, 25 and 27 crosses per game while posting 6, 3 and 3 through-balls per game. The crossing figure is up to 29 per game now with through-balls down to a paltry one per game. Crossing is not a new thing at Manchester United but more of their play under Moyes is focussed down the flanks; around 30% of their attacks under Ferguson in his last three years came down the middle of the pitch. Under Moyes, that has dropped to 24%, which is the lowest proportion in the league. This was wonderfully illustrated in this piece by Mike Goodman for Grantland earlier this season. Moyes’ tactics have seemingly reduced the effectiveness of Manchester United’s previous elite attacking levels, which matches up with the successful lowering of expectations of the current champions prospects. This entry was posted in Crossing, English Premier League and tagged Crossing, EPL, Manchester Utd by Will Gurpinar-Morgan. Bookmark the permalink. I didn’t get the image? Can you explain it? Thanks! Sorry. The red dots are where the crosses are played from and the arrows show where they were played to. Green ones were completed, red ones were not and yellow ones set up a shot. I see, well then thanks Will, I appreciate your response. Cheers! Great article. Doesn’t necessarily prove that crossing isn’t necessary for goals, but makes a strong case that emphasizing crossing as a key point of an attack is not always the brightest idea. Would be interesting to compare how teams in the league finished in the table this year in accordance to their amount of crosses per game/ converted crosses (as whats a cross if you don’t have a big, bulky striker to finish them off or lay them to the attacking midfielders).